This post has been moved to Brendan Learns to See. On Thursday, the first of November 2012, I learnt how to see. I have done art courses on and off for many years now. I’ve avoided drawing “hard stuff” like heads and hands, although I’m pretty comfortable with feet. 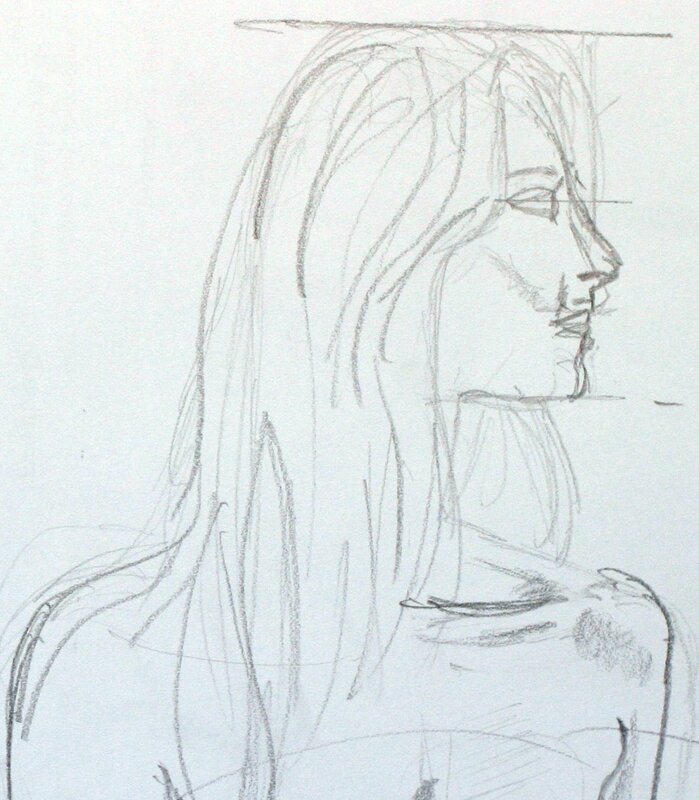 Having a headless drawing is a bit… lost. 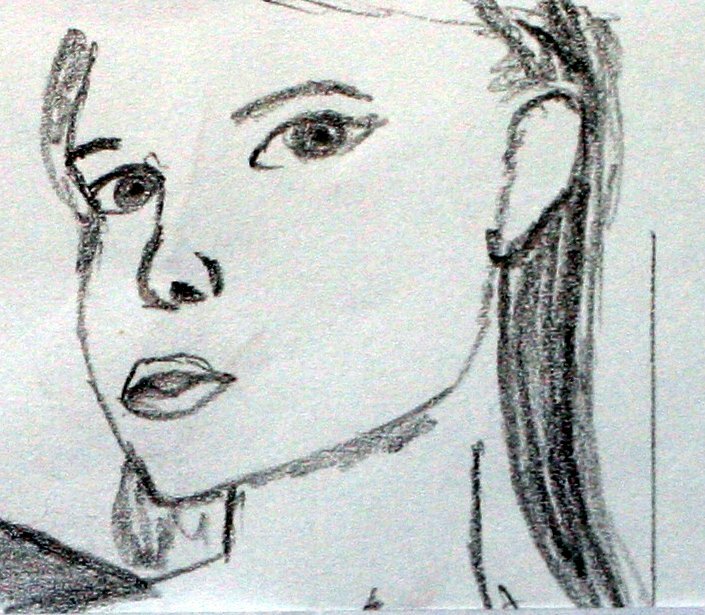 So, I resolved to learn how to draw heads and hands. The weekend before last, I thought about learning other things. 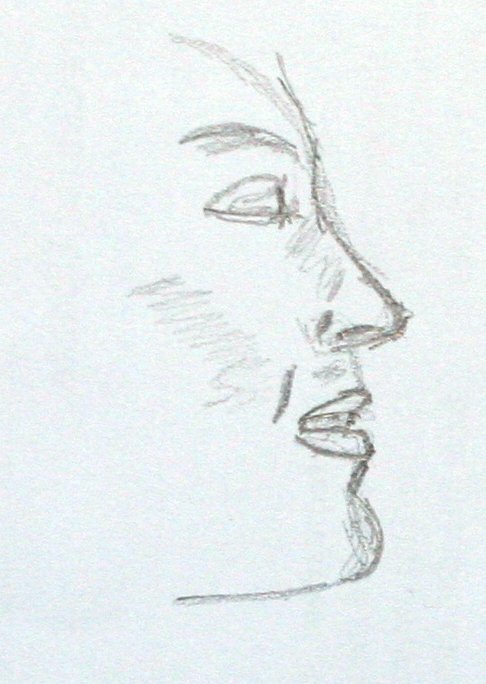 It dawned on me that learning other things had involved a lot of practice, but that I had never really practised drawing. So I figured I would make the effort practising, I have drawn from photos on the computer screen. Last Thursday, something switched in my brain. I think you can see from these that I was clearly struggling with how to represent the face, the elements within it, and its relationship to the rest of the skull/head. I probably made a little bit of progress on 31 October. 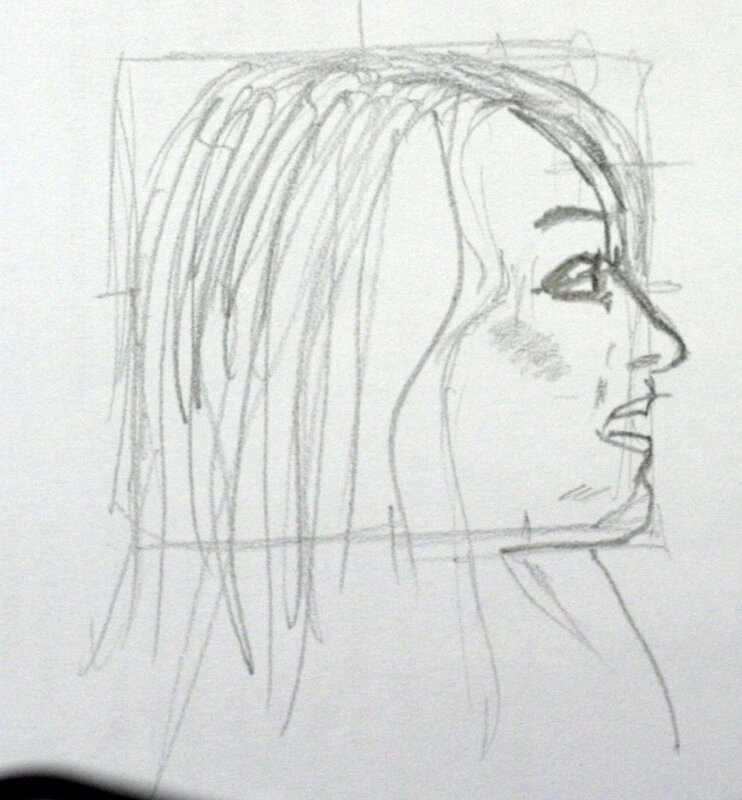 The drawings also show some use of grids for placement of elements, especially in the separate head studies. 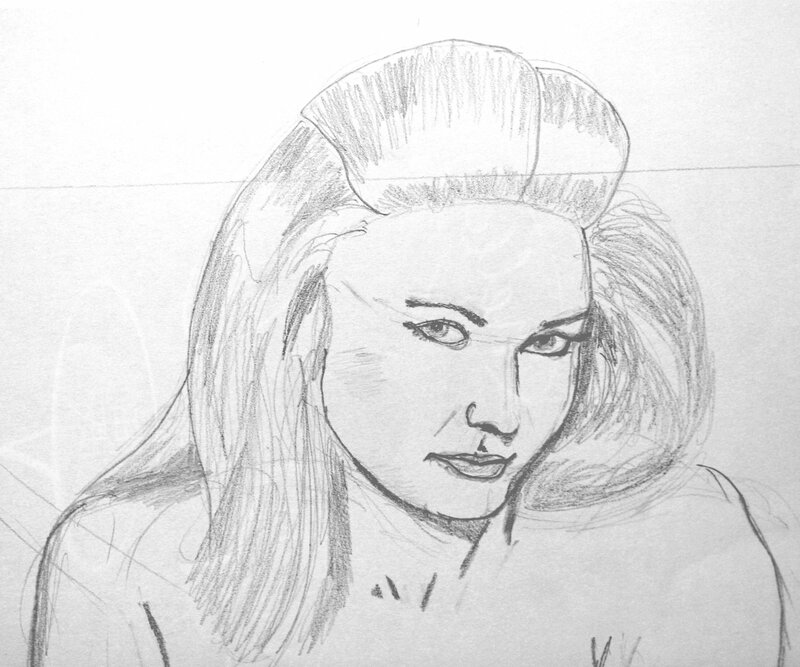 Also of surprise to me is that I am now able to draw the models’ hair. 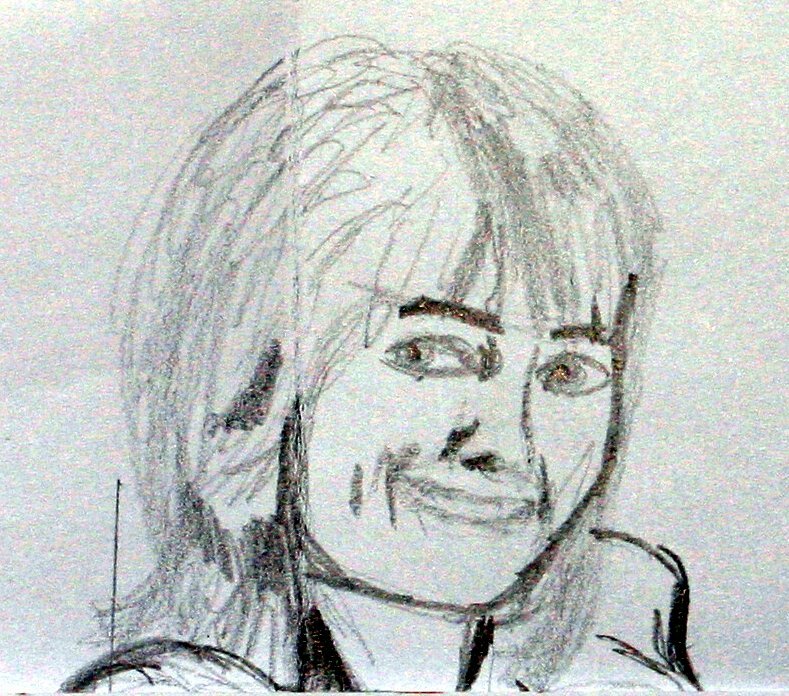 My rendering of hair improved dramatically in the 1 November sample, and has improved again in the 4 November drawing. The key thing was loading the photos into Inkscape, drawing them freehand from the monitor, then going back and using the vector drawing elements to overlay grids to show sizing relationships. Comparing these relationships as shown by Inkscape to those measured (with a ruler) on my drawings somehow snapped my brain into a different mode of seeing (presumably R-Mode to use Betty Edward’s nomenclature – I own, but have not worked from her book), one where I was simply absorbed in the drawing. I seemed unable to accurately judge variance between reality and the drawings just from sight alone unaided. Moreover, now I am actually interested in seeing. 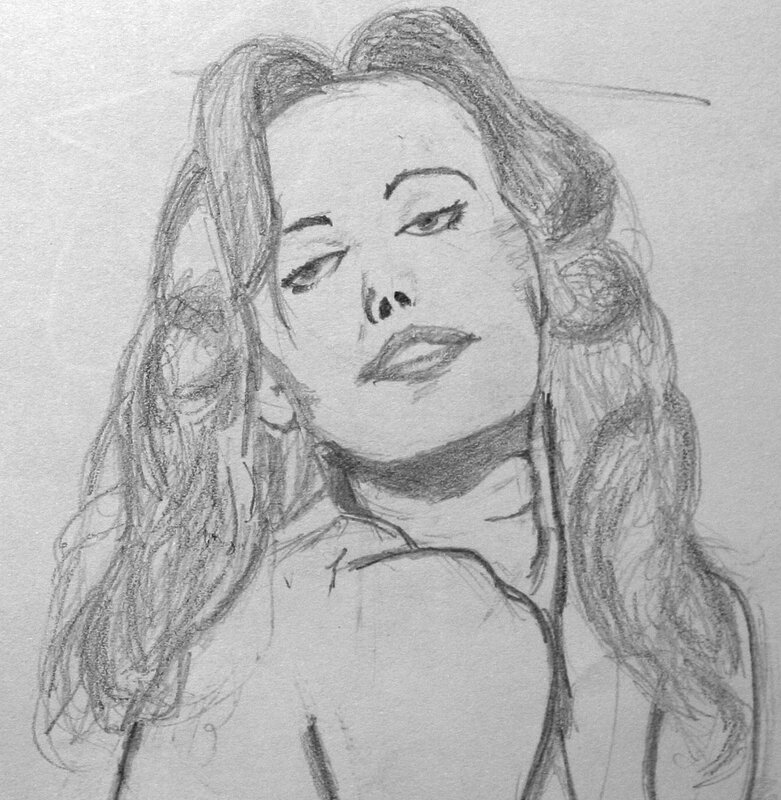 Looking back now I can tell before that, a lot of my problem was – and this is hard to find the right words to express it – I couldn’t be bothered actually looking at what I was supposed to be drawing. 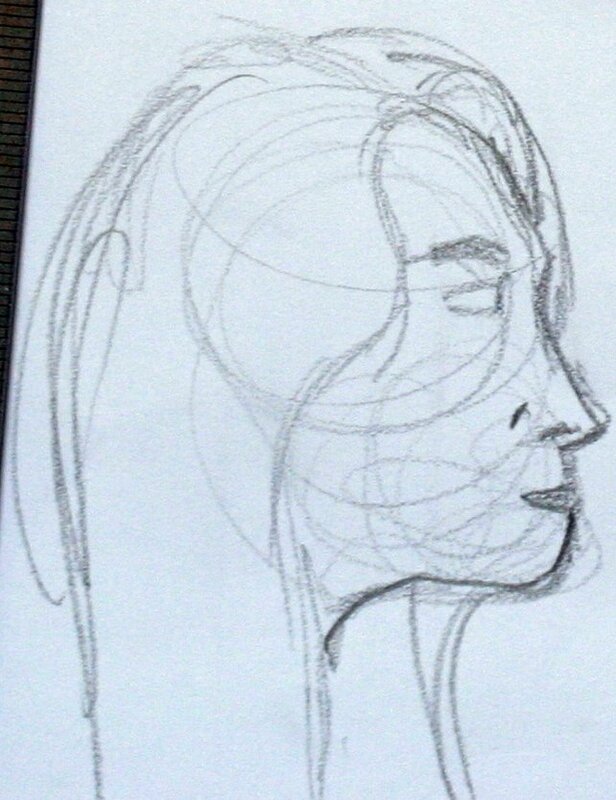 Now I’ve found I’ve spent the whole weekend looking closely at everyone’s faces, seeing how they curve, how they fit with the rest of the skull etc. Also, having used the overlays for half a dozen or so drawings I now no longer feel I need them. The following weeks will be telling in this regard. I keep looking at the drawings and can’t believe I drew them. 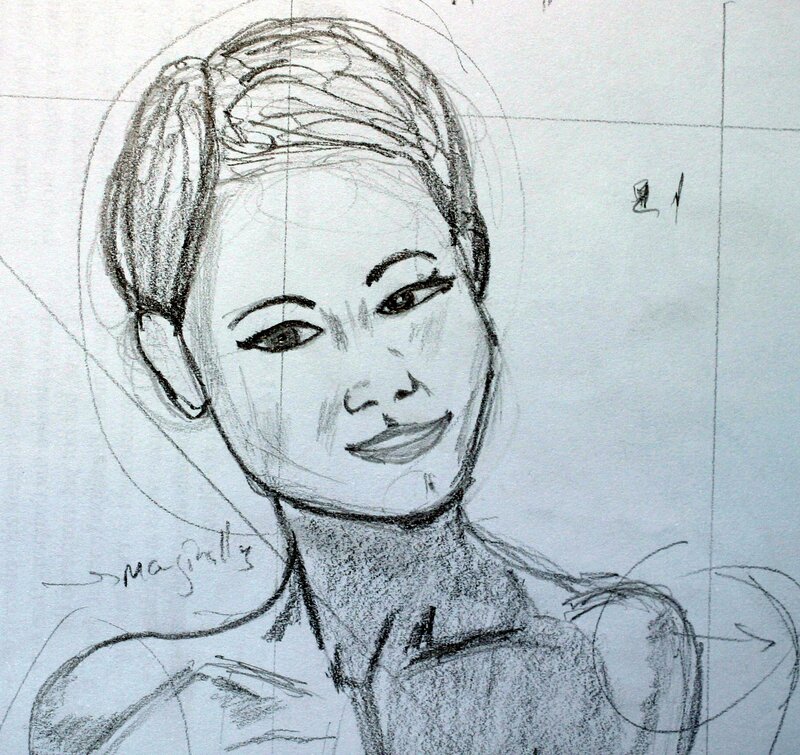 So, here’s the thing – I think if you want to draw, you probably can do it. It’s not about drawing straight lines or anything it really is just a matter of seeing differently. The harrowing story of Mat Honan is a warning to us all (SMH report here). Mr Honan’s iCloud account was “hacked” – reportedly by social engineering at the Apple help desk. Once access had been achieved, the hacker went nuclear on all of Mr Honan’s stuff, using the remote wiping facility of the products to destroy his iphone, ipad and macbook air. Tragically his iphone had been backed up the previous day to his macbook – which had also been wiped. The hacker also compromised his Google account and Twitter and, apparently, through them a Gizmodo account. The hacker was clearly being malicious. The hacker also (apparently) contacted Mr Honan to tell them how it happened. It is unclear what was motivating them, but they were clearly motivated by something. The key thing to take away from this is that single points of failure (and by implication any IT monoculture) are bad. People talk about how wonderful it is that Apple has a closed environment that they control so that they can keep out malware etc. These types of arrangement are just bad in principle because they place too much trust in a single point of failure – in this case, according to Mr Honan, Apple Tech support. Unfortunately, single points of management are attractive because they are easier. Any single point of management though is itself a single point of failure. Preferably to remote wiping is using an encrypted device to store sensitive stuff. I can’t do this on my Android devices because they don’t offer file based encryption (only disk based) and it is too much of a pain to enter a password every time you want to use the device. I do that on my laptop though, anything I would mind someone else seeing goes on a truecrypt/realcrypt encrypted usb key. I have released some Python code for auto-detecting transitions in video files. 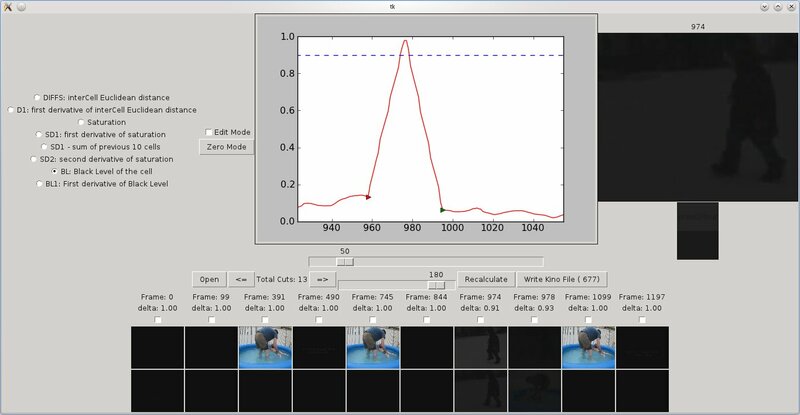 If you have a “.dv” video file comprising a number of different scenes (or, technically, shots) these shots can be automatically detected by pyShotDetect, depending on threshold parameters that are set interactively. Once you are happy with the detection, pyShotDetect will write a metadata file (an old style Kino file) which demarcates each shot. This file can subsequently be edited in Kino (eg to extract each shot). It is particularly effective on fade to/through black transitions and cuts. The transition itself is not exported (red triangle), but this can be changed if you want to keep a record of the transitions themselves. You don’t have to do each individually, there is an option to have pyShotDetect just find all fade to black transitions for you automatically. Pick it up at Sourceforge. At the start of July a repository of university podcasts from UC Berkeley disappeared from the Internet. This was the best repository of lectures I was able to find anywhere on the Internet. Some have been lost forever, some have gone to iTunes (= may as well be lost forever) and some to Youtube. Since iTunes discriminates against Android users I’ve started a repository item called UCBerkeleyLectures on Archive.org and am beginning to upload the audio that I have there. At the moment there is only one course uploaded (because of trouble parsing metadata), but I have audio from a couple of dozen. If you have audio from other courses and would like to help please let me know.